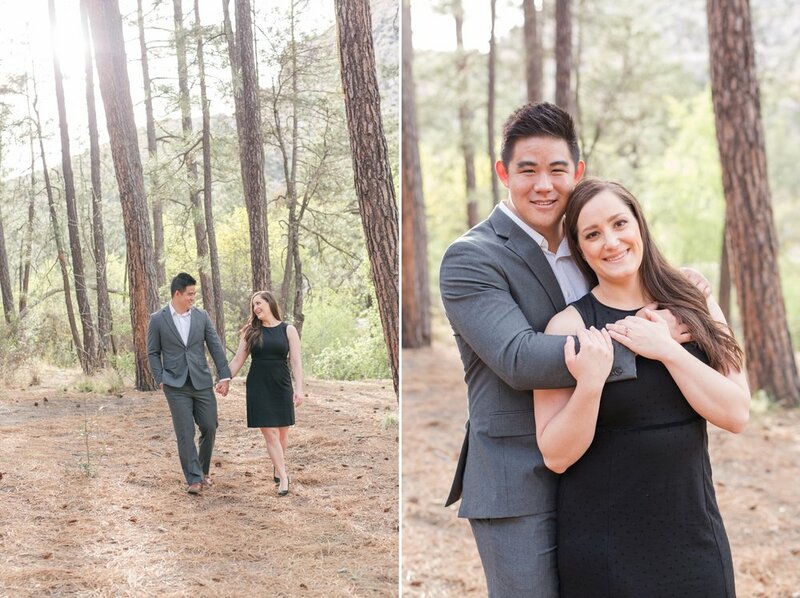 I couldn't have been more thrilled to get a call a few months ago from Sarah shortly after her Engagement to Eugene. You see Sarah and I have a history. We bonded through pain, sweat and sometimes tears during Crossfit competitions. Yes I did Crossfit. I drank the Kool-Aid and dove in head first like I do with most things I feel passionate about. I met Sarah and bonded right away with her. Not only because of her bubbly personality BUT her willingness to NEVER give up. Her strength to succeed and ambition to push hard when times get tough made me admire her even more. 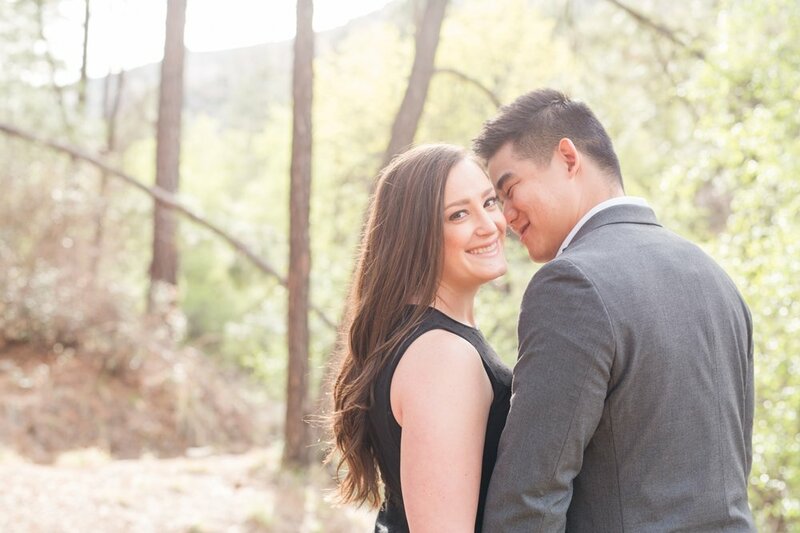 It was only fitting that Sarah and Eugene actually met while at a weight lifting gym in Tucson. Their love kindled watching each other grow stronger - Oh yeah I threw that in there...LOL...BUT seriously I can see why Sarah is so incredibly happy. Eugene absolutely adores her and treats her like a princess. 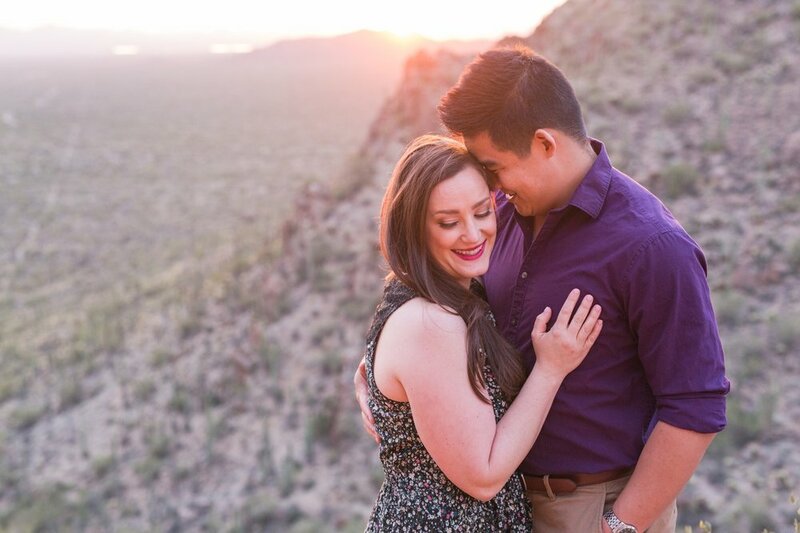 Flying to Arizona to photograph Sarah and Eugene's Engagement Session was by far one of my most memorable trips to date. 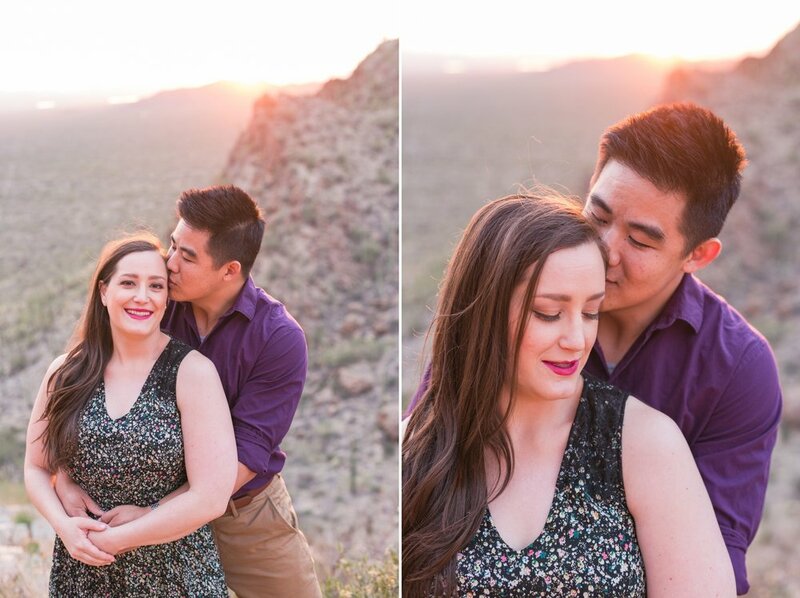 I fell in love with the cactuses, the soft beautiful dreamy light and OMG the Sunsets! Sarah and Eugene have the most kindest hearts and their ability to be so easy going and sweet just made every minute with them so perfect. 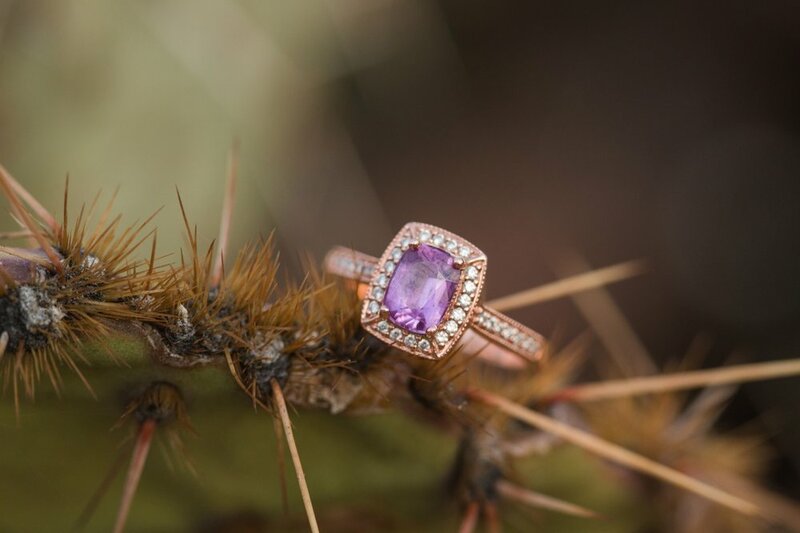 We began our adventure traveling into the Coronado National Forest in North Tucson. AND when I say adventure - I truly mean it. The road leading to Mount Lemmon is hair pin turns and crazy rock formations that make you appreciate how absolutely stunning our world is. Sarah wanted a little bit of GREEN to begin their session and we drove up the mountain searching for the first signs of GREEN and stumbled across a sweet little spot of heaven. The LIGHT, their stylish outfits and their LOVE - It was so amazing! It was the best of both worlds and very sentimental to them. 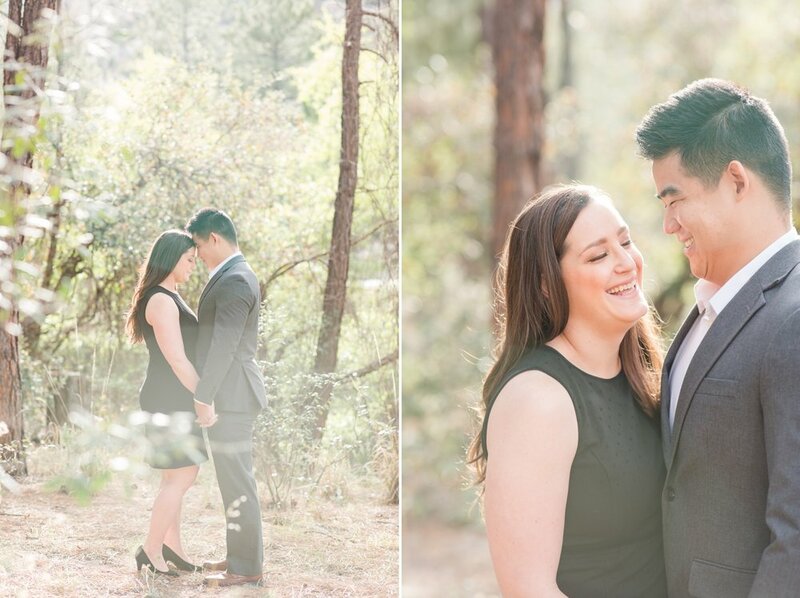 Eugene proposed to Sarah on Mount Lemmon so being able to share their sentimental place with them was so humbling. We then made our way WEST to Gate's Pass where Sarah and Eugene's description of the most incredible sunsets ever did NOT disappoint. 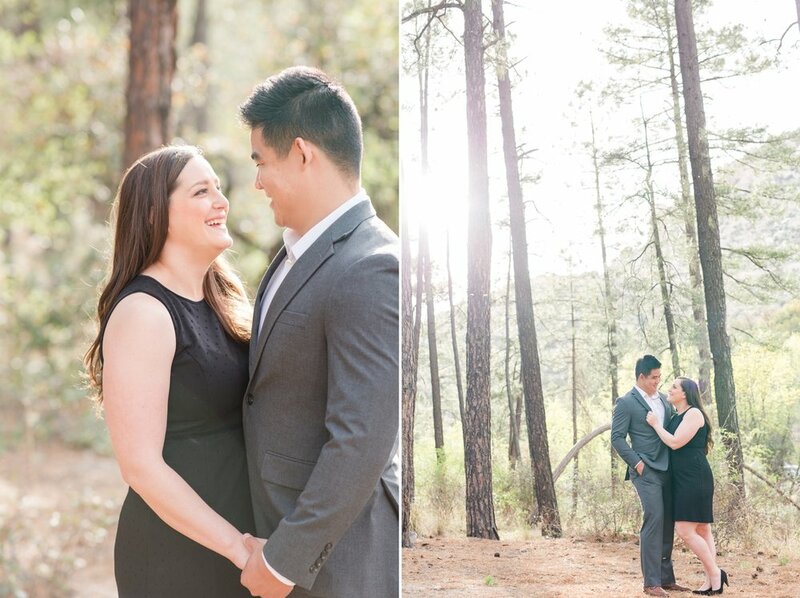 We scrambled our way onto the mountain side and while there was a bunch of other sunset seekers there - It was absolutely breathtaking and was the perfect location for capturing more of Sarah and Eugene's beautiful love. I will NEVER forget sliding down a mountain on my fanny capturing that scene and I believe Eugene and Sarah have a new respect for what I would do for my clients....I was referred to as the "Lara Croft of Photography"...Hell yeah - I will totally take that reference! The city of Tucson has some of the most amazing nightlife and NEON signs. 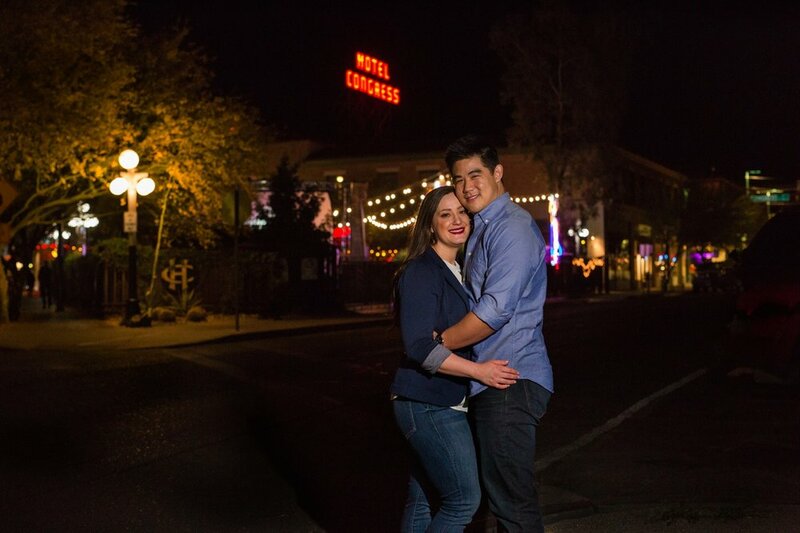 I felt like we stepped back in time and I loved that Sarah and Eugene shared their historic town with me. Our night ended walking downtown Tucson and documenting the infamous Hotel Congress. I can't even put into words how much I loved being a part of their LOVE. I hope you enjoy a few of my absolute favorites! 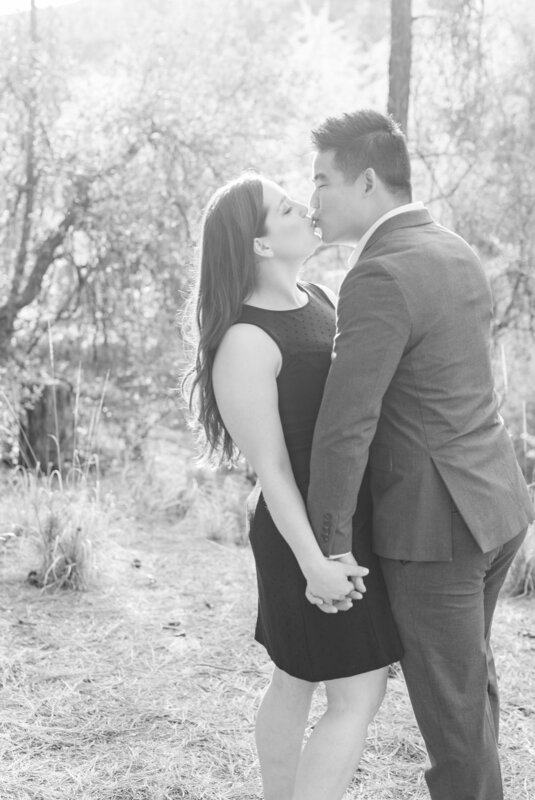 Cannot wait to go back in January for your wedding day Sarah and Eugene. Lots of love. If you look really close - This beautiful blue bird was following us throughout the session in the woods!